Should you teach cursive handwriting to your kids? I could just say YES and be done with this entire post. But I guess I’ll elaborate. 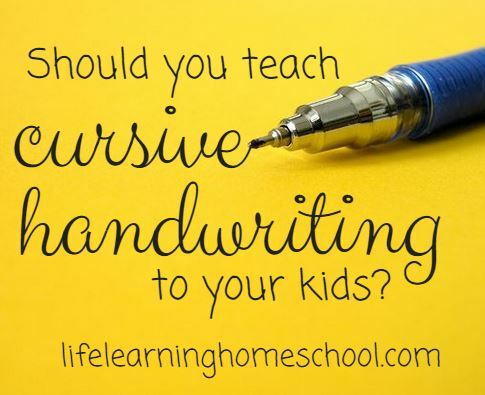 So what are the reasons for teaching your children cursive? Historical Documents are all written in cursive. Do we want a generation of people who are unable to read original historical documents? Important family documents may also be written in cursive. Notes in the family bible, letters great-grandpa wrote home during the war, your great-aunt’s famous cornbread recipe – probably all written in cursive. What good is it passing these mementos down to our children if they can’t read them? Taking notes is quicker in cursive. I take notes every Sunday during church. They’re all in cursive and pretty much everything else I write is print. Research shows that writing in cursive uses a part of our brain we don’t normally use. And I’m a firm believer that if you don’t use something you’ll lose it. So I’m all for exercising as many parts of our brain as possible! You have to know cursive to have a signature. Signatures are as unique as you are. Without cursive, you’ll never have a signature. And there are some pretty important things that require a signature – driver’s license, marriage certificate, legal papers, financial papers, etc. It’s a fine motor skill. Meaning, the sooner your child starts practicing it the sooner his fine motor skills will be honed. And probably a lot of other reasons…. Ready to start teaching cursive? So, WHEN should start teaching cursive? Well, I say it’s never to late to start! I went to private school and I started learning in 1st grade. I think that’s a good age to start. I know some people teach their children cursive before they teach them print! That’s okay too! BigG is in 2nd grade right now and we started cursive on his first day of 2nd grade. Full disclosure though, he’s 1st grade age – he skipped Kindergarten last year – so he’s the same age I was when I learned. That’s one of the reasons I held off last year when we started 1st grade. I wanted his maturity level a little higher before we started – getting him to write anything last year was a hair-pulling ordeal Shortly before we finished our year last year, he saw a cursive book and said, “When are we going to start doing that?” And I said 2nd grade. And he said, “Oh, but I want to do it NOW!” He was really excited about it. I had to fend him off the last couple weeks of school because he realllllly wanted to start Cursive. On our last day of 1st grade I showed him his name. He practiced it all.summer.long. And talked all summer about how he was going to learn cursive in 2nd grade! So go figure, I guess I could’ve started last year! So I guess the moral of the story is to start teaching them when you feel like they are ready. If it’s not working, shelve it for 3-6 months and try again! Are you an educator or parent who wants to spend time teaching your kids how to write in cursive? If so, these resources from Educents will make it a lot easier and FUN to learn cursive. to code by modifying (or “modding”) Minecraft®? Kids learn how to code in Java® and apply it to Minecraft® themed problems! The WriteWell App– A simple and intuitive web-based tool that makes writing fun and effective. With its unique visual and tactile interface and library of interactive essay templates, WriteWell is a convenient tool for teachers and students at home or in the classroom. Will you, are you or did you teach your children cursive? Absolutely cursive! Thanks for sharing so many cursive related links!